Last month, the Colorado Coalition for the Homeless opened a new health clinic that integrates comprehensive health care and housing. The Stout Street Health Clinic offers a range of services, including medical, dental, vision, pharmaceutical, and behavioral health care, and also includes over 70 supportive housing apartment units. The previous clinic was unable to meet the health care demands of the city’s homeless population, and routinely turned away patients and had long waitlists. With the increased capacity of this new clinic, they expect to serve 50% more people. The clinic is also expected to reduce overall state and local costs for emergency health care and other services. In addition to an increase in capacity to provide adequate care, the health center offers two particularly important features. First, the co-location of multiple health services (e.g. physical, mental, vision, dental, etc.) provides patients with a one-stop option for health, and allows for practitioners to instantly connect patients to additional services. Second, combining apartments and health care in one complex provides supportive housing options that may be more appropriate for individuals with significant medical vulnerabilities. This program is one of the most innovative, advanced, and integrated approaches to helping people experiencing homelessness that we have encountered. Of particular note, the entire agency, including architecture and human resource functions, is guided by trauma-informed care principles. This is an excellent example of how states can seize opportunities made possible under the Affordable Care Act (ACA). Photo from Colorado Coalition for the Homeless website. 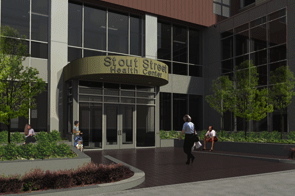 The Stout Street Health Center was built in part with ACA capital funds. Further, with the Medicaid expansion in Colorado, an estimated 65% of patients served are now covered by Medicaid. This is an increase from roughly 15% prior to the expansion. To learn more about how the ACA and Medicaid expansion can be used to strengthen homeless services, read the Center’s recent paper on the topic here. Reliable funding streams to help people experiencing homelessness are greatly needed. The Patient Protection and Affordable Care Act (the ACA) and Medicaid offer substantial opportunities for such funding. This is made possible primarily through the optional expansion of Medicaid and adoption of Medicaid waiver services and state plan amendments. With this paper, we provide information about Medicaid and non-Medicaid provisions that states can implement to increase access to services and to expand the types of services available to people experiencing homelessness. This includes components established by the ACA as well as pre-existing provisions. We also present examples of how some states have already taken advantage of these opportunities. Finally, we provide homeless service agencies with guidance on how best to advocate for change in their state.